Home » woodworking » Bang the drum slowly.. Some time ago on this blog I wrote: If all it took to kill “fine” furniture-making was IKEA then the trade deserved its fate. I stand by that statement even more so today than on the day I made it, but I would like to add an to it an addendum. For the profession of woodworking may indeed have been “killed” by so-called cheap furniture, but the profession’s cousins, woodworking media and hobby woodworking, were murdered by the very people supposedly perpetuating their existence. I have been woodworking on a regular basis, meaning weekends, for the first time since last November. However, I have avoided woodworking media, magazines, books, and even videos, almost completely…that is until this week. I checked out a few (there are only few left) of the sites I used to view almost daily and almost immediately I discovered both the murderers and the murder weapon(s). What was most frightening was not the content, which was disturbing enough on its own level, but the comments made after the fact. Instead of woodworking, I found pseudo-intellectual babble, BS political and economic philosophy, sycophantic kiss-assery (if you’re going to make fun of the President at least be funny and original), and worst of all: no dissenting opinion. Why would there ever be a need for dissenting opinion on a woodworking site? Because it appears that these sites no-longer are about woodworking, they are about pushing an agenda that is quite frankly scary to me. Of course, I’ve made mention of this before, approximately 5 years ago, but I did not foresee the fall happening so quickly. So what murdered hobby woodworking and the media related to it? A small handful of woodworking journalists. What was the murder weapon? The ideology they created in order to destroy competition, drive up costs, and sell their own products. Who were the accomplices? That is a little less clear, but my money is on the people who leave all of those lovely comments. As I have said over and over and over again, the one thing that would and could end woodworking as a popular and viable hobby is the alienation of the working people who once were the professionals in the trade, and the middle class people who were once the majority of the hobbyists. This small group of writers managed to do both, and I have to give credit where credit is due, they did an absolutely terrific job of it. The few magazine editors still left are all journalism and English majors who may or may not have had a relative who once was a carpenter. The site operators are more focused on pushing products, a political agenda, and a horrible economic philosophy than actual furniture making. And the relative few who still read the very few magazines still in operation are upper middle class/wealthy people (nothing wrong with that in general, mind you) who have somehow come to despise capitalism and are now waging a war against “the man” and his “machine”. I have to break it to you folks, and I hate to bring political ideology into this on my end, but the vast majority of hobby woodworkers I have met were and are what I would call politically conservative. When they pick up a woodworking magazine or sign on to a professional woodworking blog they really don’t want to read a political diatribe against corporations, religions, and the government. They don’t want to read comments such as “I’m a risk analyst for Manhattan Life, but I hate corporations! Down with the man!”, and they don’t want to be told that THEY are the problem, because they are not. So what is the problem? First and foremost, much of the crop of woodworking writers who appeared as the new millennium began were not actual furniture makers. As I mentioned earlier, they were a group who studied journalism, or English literature, or marketing, and they couldn’t find jobs in their field because those fields are competitive and don’t really pay much, and frankly are far less relevant than they were in the past (for the record I am not belittling any of these fields, they have merits just as any other line of work does. I am only stating that in the current job market these fields are somewhat saturated). This group, who really couldn’t write about woodworking in a way that spoke to hobbyists because they were likely even less experienced than their audience, decided to write about esoteric topics disguised as woodworking projects while at the same time interjecting their own political and economic beliefs into their work. In these magazines, actual furniture making became less important and was replaced with witty banter and subtle jabs at those who were not indoctrinated into the writer’s own beliefs. While I have zero magazine editing experience, I can’t imagine that alienating a large portion of your target audience is good business practice. As the magazine’s focus became more narrow, more readers were lost. Couple this with a bad economy and suddenly tool companies stop advertising (mostly power tools, which remember are “bad”) and cheaply produced internet shows begin to take the place of long running television series. Because power tool companies advertising revenue drops considerably, power tools are even more vilified by the writers. The magazines focus narrows even more to cater to a more narrow readership and soon enough many different options are replaced by very few. The few magazines still operating focus on hand tool work. In and of itself hand tool work is a fun and viable way to woodwork, but the writers cannot keep from continually narrowing their views. It no longer is acceptable to use hand tools unless those tools meet a rigid criteria. Writers begin to focus on minutiae which has little to do with actual furniture making, but who forged your holdfast, where you purchased your saw, which company made your chisels, where you purchased your wood, and which country your workbench originated from. These things and not furniture became the focus of most woodworking media. Single furniture forms are pushed continually in order to sell books and videos. More and more people are turned off. Who are those people who were driven away? I am one of them, and as a middle aged, middle class man I believe that not so long ago I represented the demographic which made up the bulk of hobbyist woodworkers. Today, woodworking magazines are a pale shadow of what they once were. Woodworking television shows are virtually non-existent, and the woodworking “blogosphere” is a near black hole of nothingness. 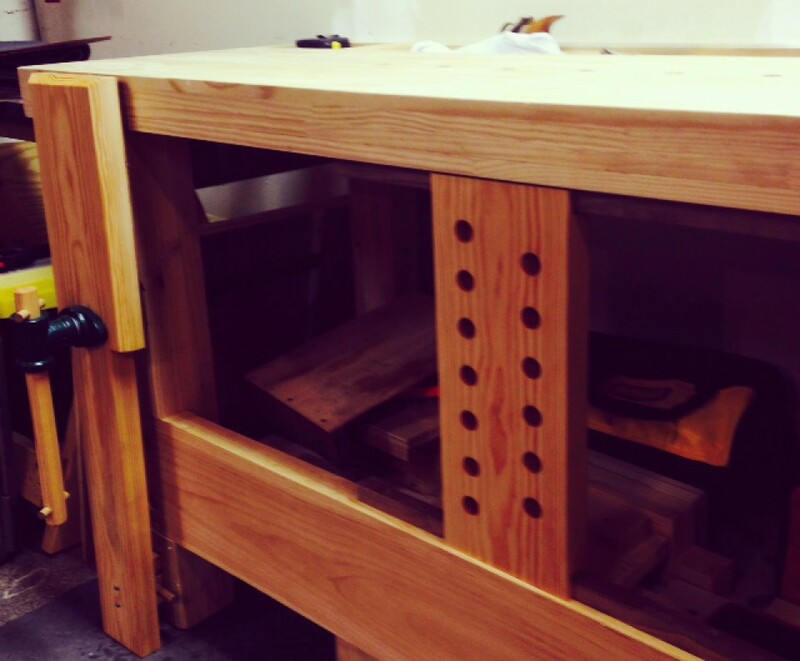 The few blogs remaining spend more time on political preaching than on woodworking. Corporate maligning has replaced content (a small-company can screw you over just as easily as a large corporation and you’re kidding yourself if you think otherwise). And woodworking experts have been replaced by internet gurus. So, yeah, just as the profession of “fine” furniture making has died, so too has the hobby along with its corresponding media outlets. The profession no longer exists for a number of factors. Some people will blame large furniture manufacturers, and that is a part of it, but in reality the profession has died because it is no longer necessary for the survival of the human race, which is the same reason that dozens if not hundreds of now non-existent trades have vanished. It is now a quite minor specialty field. And though hobby woodworking didn’t need to follow suit, it has for the reasons I discussed in this post. It’s quite sad, really, because I used to enjoy the media aspect of the hobby. Now, I get my woodworking media fix the old-fashioned way; I watch re-runs of The New Yankee Workshop on YouTube. By billlattpa in woodworking on August 16, 2018 . Amen! Although I am one of the unplugged woodworkers that think power tools are bad (LOL), I agree with you. I have been building furniture (unplugged) for over twenty years and am constantly reading that I do not have the right tools… imagine that! I was a member of one of those woodworking blog/message board communities. Thankfully, I was banned from the site. Too much politics, unrelated bantering and menopausal old men touting this or that. Very few discussions on actual woodworking. As you are getting your media fix with re-runs of The New Yankee Workshop, I am getting mine with re-runs of The Woodwright’s Shop. Thanks for the post, it was well written! Thanks for the comment Ron. I too am an unplugged woodworker, for the most part, but I have nothing against power tools in the least. In fact, I would probably have more if I had the room. But I agree with everything you say. At a time when woodworking writers should be attempting to promote the hobby, they continually create more division by attempting to force their beliefs down the throats of people looking to have a little fun on the weekend. Thanks for the tip re yankee work shop..I agree with you! Great Post Bill (and Ron)). Oh well, I have better fun out in the workshop than watching or reading anything about woodworking these days. I think you eventually get to the point where you’ve kinda seen and read it all before anyway. But it’s funny you wrote this because just last night while visiting my local news agency I actually found some woodworking magazines tucked away in the corner so thought I’d flip through for the first time in years to see what’s been going on inside those pages. I actually thought about one of your previous blog posts Bill! While I was flipping through, so that’s weird that you wrote this write now. Anyway, I flipped through and saw nothing that caught my eye, just page after page of ads, it was so thin, light and glossy it almost just wanted to slide out of my hand and back on the shelf by itself. Then I saw the price!!! it was AU$26, for that rubbish. I don’t think I’ll ever buy one again. It’s a shame, I used to like picking one up every few years just for a look but at that price you must be kidding. There were a few cheaper ones but they were even worse value. Sad but true, this hobby has now become……, well I don’t know but it’s not good. I know what you mean about forums as well, gave up on them years ago. Just ignore it all and get on with your own life and try not to think about the world. Then you’re accused of being a grumpy old man or an unsocial hermit. Let’s face it, as ageing white men we are doomed to end up that way. I pulled a really long (grey) hair out of my ear last night,… like really long!! It’s starting already!!! Just embrace it. These things we cannot change. That hand plane that is getting blunt you CAN change. Go forth and sharpen my friend. It’s good to simplify every now and then as well. I’ve been making chopping boards and soap holders, just simple things but I have been enjoying the change, everything else in life just annoys me and has become over complicated or keeps crashing since the last security update which I’m always told is necessary. My chopping board is a simple block of wood, nothing more and doesn’t promise to be anything more. Tool in hand, stand at the workbench and enjoy. Thanks Andrew. Like you I have given up on the media aspect of woodworking. The last time I went on a forum was nearly a year ago, and that was to research a finish. Like a glutton for punishment I keep going back and keep getting more disappointed. Yes, we are getting old, and maybe that’s the problem :). Yet, the older I get it seems to be easier to let things go. This post, while seemingly a rant, really was just an observation. There is no anger or sadness on my end, just disappointment. As I said, I really used to enjoy woodworking magazines and shows etc. Now, there is nothing left to enjoy. I don’t know what you are reading but given the amount of unhappiness it generates, finding something else would benefit you. I wouldn’t call it unhappiness, just disappointment. As I said in the post, I really enjoyed reading woodworking magazines and blogs at one time, blogs in particular were fun. Now, the few remaining magazines are shells of what they used to be and the few remaining blogs are more concerned with the merits of different economic systems rather than woodworking. I admit that I had been out of the loop for a while, but I didn’t expect it to get so bad so quickly. I never understood why any business would take political sides. I too am sick of the political talk in woodworking magazines, blogs, and Instagram accounts. Woodworking is a release from day to day stress. The last thing I need to is to read or see political crap. I don’t get any of it. I saw one post stating that we don’t want your business if you voted for such and such etc. How in the world did a person’s voting preference become a prerequisite for buying a woodworking related item? there are a couple of woodworking companies that I use to buy products from that I won’t give them a dime of my money anymore. And I’m sure you know which one I’m talking about. Agreed, that among a few others as well. In fact, I no longer purchase anything from small makers. Yes I agree and it’s at a scale I’ve never seen before. It’s like since it’s Trump in power it’s now a free for all to talk about it and express what side they are on. Who really cares? Especially when you’re looking to read about something you love to escape from all that. Unless he’s saying he’s joining the local woodworking club or he’s going to make a shaker style stool, then and only then I might be interested in his opinions. The rest of his life or job, or hair style, I couldn’t care less. I view Donald Trump the same way I have every other President in my lifetime, there are aspects that I both like and dislike. What has bothered me most during his Presidency are the threats, rhetoric etc regarding the office. For instance, I did not really care for George Bush as a President, and Barack Obama I liked only marginally better. I voted for neither of the two if that matters. Regardless, had I met George Bush I would have shown him the respect his office deserved, and a few years back I happened to be in DC and we saw Barack Obama and I immediately picked up my daughter and put her on my shoulders so she could see the President. Why? Because he was the PRESIDENT OF THE UNITED STATES!! And the way I look at it. Worse comes to worse whomever is in office will eventually be gone. Can someone name something specific showing that political commentary has taken over woodworking blogs? There seems to be a lot of winking and nodding about “I’m sure you know who I’m talking about” but no specifics. What is the actual problem and are there two examples that can be cited? For what it’s worth, Confusedwoodworker has mentioned Trump more than any other blog I’ve read and he seldom posts. I’ve mentioned Trump in exactly one post 18 months ago when several woodworking companies made direct mention of him not long after the inauguration on their web pages. If I’ve somehow brought it up since I cannot find it. The politics I am referring to possibly have something to do with him, but you would have to ask the people writing the posts and commenting on them that because they rarely name names, which is why I will not on my part. If you want specifics, I’ve seen more than a few references to “current political climate”, “white guys”, “lack of inclusion”, “old conservatives” etc. Of course this is subtle and not so subtle insinuation aimed at a particular group of people. Or am I reading too much into it? Maybe, but the comments after the fact pretty much spell it out a lot more clearly. Maybe you believe me, maybe you don’t; that’s your choice. I know what I saw, I saw it more than once, or twice, or three times, or four. Politics and identity politics and agenda politics have crept their way into woodworking, and I want nothing to do with it. Maybe I’m one of the few, but judging by the desert that is now woodworking media, I think a lot of people feel the same way I do. I’m just the stupid one who makes his feelings known. A year ago a dude wrote that he tears the American flag off of his apparel because he doesn’t want to be seen as pro American. Pissed me off so he’ll never get another dime from me. I haven’t seen that but it isn’t surprising. The same people who supposedly hate the political and financial ideologies of this country are the same who owe their well-being to it. This is what happens when woodworking media outlets are not actually operated by furniture makers but indoctrinated journalists and language arts majors. These are the same group of people who would rather erase history than learn from it, who would squash free thought while claiming to be the biggest proponents of it, and who bash the free market yet make their living from it. I have not purchased a woodworking magazine or book in 2 years, and I likely will never again. I will absolutely never purchase a tool from a small maker again, even though I would imagine that at least some of them are attempting to make a living just like anybody else. But when you receive endorsements from a group of people that I disagree with in almost every way possible I cannot in good conscience lend support to that business. Sorry for the late response, but as you know, I rarely fire up a computer while at home. It is good to read that you have gotten back into working wood in the weekends again. I removed the link for Popular Woodworking Magazine from my blog, because I got fed up with the new homepage and especially the fact that they removed all the links to woodworking blogs. I never understood the idea of bashing on your core readers, and I guess that it might have been why Megan stopped as editor. But that is only my guess. If it was my magazine, I would have expected the managers and editors to cater for those who read the magazine, and perhaps even try to catch a few new readers from other groups if possible. But going all in on attracting female woodworkers might not have been the best idea. The sad thing is that as soon as the female woodworker crusade started, people commented that they really weren’t interested in reading about that in a woodworking magazine, but the editorial management continued anyway. In my world it is OK to make a mistake or two, but the least thing you can do is to acknowledge that you have screwed up, and then apologize and stop. Hi Jonas, good to hear from you! As usual, just as I am about to give woodworking magazines/blogs another chance I end up disappointed again. It is my own fault. But there was a time when I really enjoyed reading the magazines and the forums and blogs. It looks like now those days are gone and will likely never return. Politics, not just in the sense of government, has crept into woodworking. I would assume that I am just like a good majority of amateur woodworkers, so I think I can say with some certainty that most amateurs really wouldn’t care regarding the gender of the woodworker, and would rather be more interested in what was being built. I think a good example of this would be a woman who does carvings (I am doing my best to not name any names because it has all become ridiculous) but she does awesome work and I think her gender has nothing to do with it. If I have learned anything, it is that people do not like “forced acceptance”, even if they agree with the premise. I cannot see the need to attach an adjective to a furniture maker’s name etc, “female woodworker”, “transgender woodworker”, “liberal”…That being said, it is happening, and those who do not care for it are called bigots, or haters, or what have you. Just let the furniture speak for itself, because if it is good it will need no embellishment, and if not the political or sexual orientation of the maker doesn’t really matter much anyway. Sadly, the media aspect of the hobby is greatly diminished. Few magazines are left, and even fewer programs on television. The blogging world is all but empty and even YouTube seems to have far less material than it did a few years back. On that note, I have more than enough tools, older magazines, and other materials to keep me busy for a long, long time even if all of the remaining magazines and programs folded up shop forever. I am just lamenting the loss of an aspect of that hobby that I at one time enjoyed greatly. Superb article, Bill. Glad to see you getting some time yo be around woodworking. Getting close to some in my spare time too! Also, I notice that my comment links to a dreadfull attempt at blogging I made. I’ll blame it on the epileptic drugs I was taking at the time. It’s a welcome reminder that I should shut up and just get oncwith making things!